Ritam & Dyuti | OK Listen! Ritam Sen and Dyuti Mukherjee are song-makers, if such a term exists. They write and compose songs as a team. Mono Aji is the result of their collaboration with various artists and musicians. Vocalists Lagnajita Chakraborty and Soumyajit Murshidabadi have lent their voices to this composition. Neel Sarkar have arranged the music, and played the Guitar. 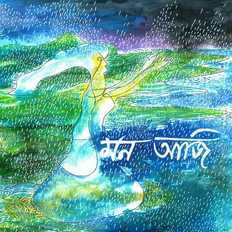 Sutanu Sarkar on Esraaj, Sushruta Goswami on Bansuri, Pritam Sengupta on ethnic percussions and Sabyasachi Deb on Bass Guitar have provided the instrumental base for the song. Learn more about the making of the song here.